With the Activity Pass 1 you have the flexibility to choose either Snorkeling Equipment OR a Glass Bottom Boat Tour. Plus you also have use of the other beach hire equipment including the stand up paddle boards, paddle ski’s and ocean trampoline. Fitzroy Island was once part of the mainland, before being separated by rising waters. Over time a fringing coral reef surrounded the island, providing a sheltered home for a variety of fish and coral species. The Island’s 339 hectares are covered in lush rainforest with 94% of the island (326 hectares), protected and managed as a National Park. Walking tracks for all levels of fitness allow you to explore areas of the island at your leisure. 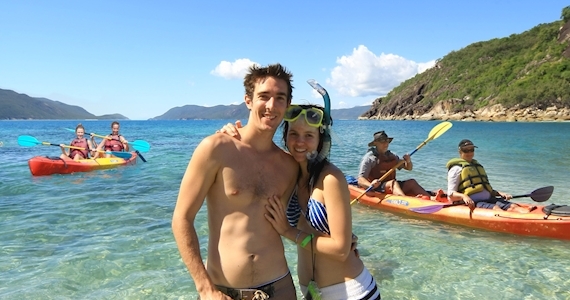 There is so much to do on Fitzroy Island, and the best part is it’s only 45 minutes from Cairns ! Insurance charges, port fees, fuel surcharges, administration charges & GST of $5.00pp is payable on the day. All children must be accompanied by an adult or guardian 18yrs and over when travelling to the Island. You must check in a minimum of 30 minutes prior to departure, with ferry boarding closing at 8:50am. Minimal access available for disabled persons.